At first glance, a 1-2 record in the 2011 Mid-State Conference tournament may not seem an especially successful venture. Boone Central Coach Dan Zoucha, while wishing for more victories, was pleased with his team’s efforts and felt the young Cardinals took positive strides during the week. “The Mid-State tournament is one of the toughest in the state,” Zoucha noted. “At one point this season, five conference teams were ranked in the top tens of their respective classes. Boone Central opened Mid-State tourney play Wednesday against a solid Wayne (14-6) squad, dropping a 59-48 decision after leading 31-27 at halftime. The Blue Devils used a key stretch of the third quarter, outscoring BC 16-4, to alter the momentum and outcome of the contest. “The first half was one of our best all season. We were able to dictate the pace and make Wayne hurry on offense,” Zoucha said. “We began to turn the ball over at about the two-minute mark of the third quarter and that gave Wayne the momentum. 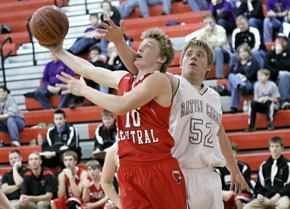 Boone Central outscored Battle Creek in each of the first three quarters and methodically pulled away from the Braves for a 61-43 victory in consolation action Friday. Temme (9 points), Tanner Mazour (8) and Derek Gentrup (8) helped the Cardinals get off to a fast start offensively in building a 36-24 halftime lead. “This was one of our most complete games. We had four players in double figures and a season-high 23 assists,” Zoucha noted. “We rebounded well and shot better from the floor than any game this season. When Boone Central and Pierce meet in the Mid-State tournament, you expect a low-scoring, physical contest, no matter what round or what place is at stake. Saturday was no exception as the Bluejays notched a 44-34 win over BC in the fifth-place game of the 2011 tourney. “Any game with Pierce will be a ‘grind-it-out’ type game. Pierce plays very tight man-to-man defense and adjusting to it is a key to competing against them,” Zoucha commented. “We battled ourselves a little in the first quarter with six turnovers. However, our turnover rate decreased as the game progressed. This shows a sense of maturity we might not have possessed earlier in the season. “Down just four after the third quarter, we were in a good position to make a charge. We did get some good looks, but we were unable to be consistant on the offensive glass.